I was fortunate enough to spend Tuesday and Wednesday of this week with my sister and brother-in-law at the Canon Beach/Seaside area. I decided to drive up the coastal highway from Eugene – slower for sure but I think much more interesting than just blasting my way up I-5 and then over to the coast. Storms were predicted and they came about. 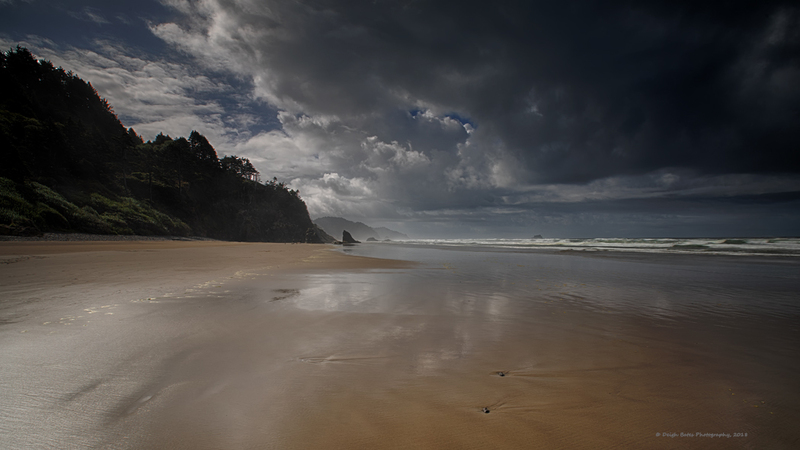 Lots of intense rain showers as I drove along but it cleared from time to time along the road and when we connected at Hug Point, just south of Canon Beach, it was relatively clear – nice building clouds and you could tell there were other bursts of rain in the future. We packed up and headed for the beach. What fun! I was just drawn into photographing the beach and the hovering clouds. 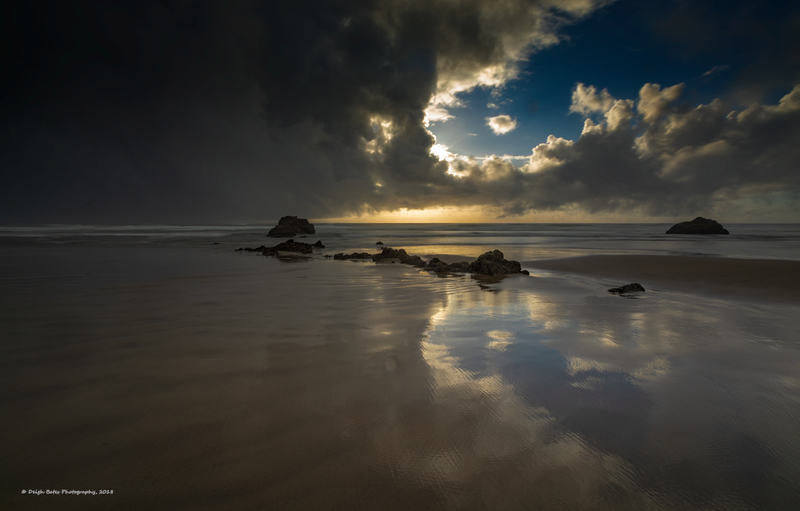 Got so involved that I did not pay attention to the incoming tide and am grateful to my brother-in-law for the gentle nudge – “Let’s get out of here the tide is coming in” Did a get a nice shot of the next incoming storm cloud against the headland. We got settled in various motels and gathered for dinner at a local seafood restaurant in Seaside. The plan for the evening was to go back south to Arcadia Beach just south of Canon Beach. Such a different evening than the time I shot up there a couple of years ago. The image below is my attempt to capture the next incoming storm cloud and I have say it was not more than 10 minutes before it unleashed a torrent of rain. Thanks again Paul for the help getting body and camera off the beach in the driving rain. We were both pretty soaked by the time we got to the car. My sister had wisely headed back earlier and she stayed dry. Back to a dry Seaside and a nice bottle of wine given to me by Dr. Heather Erickson of the CFC – sat on a nice deck and watched the last of the evening light disappear. 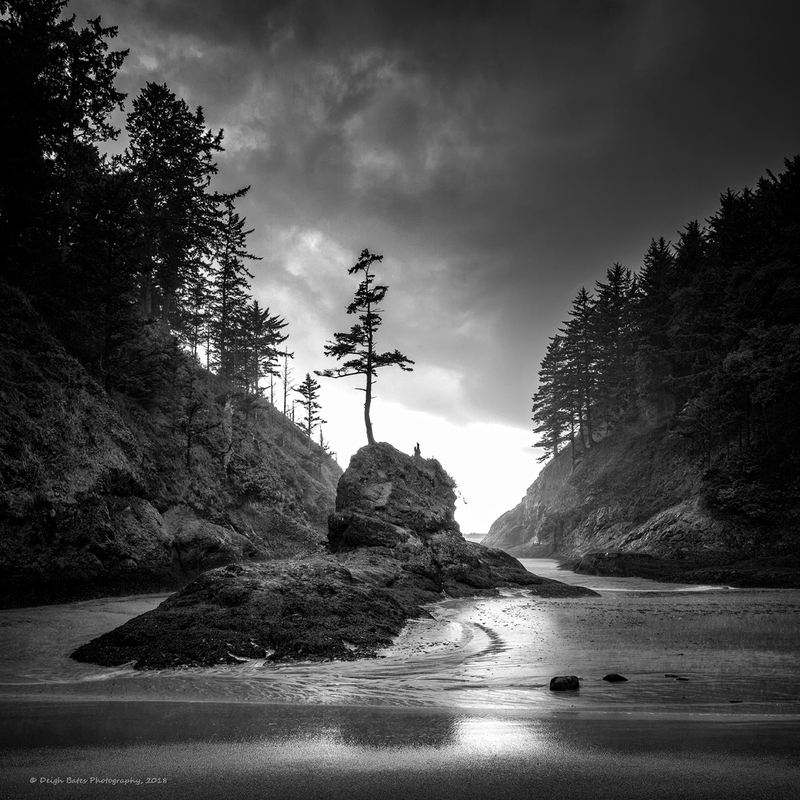 My goal the next morning was to drive to the small Washington coastal town of Ilwaco with the intent of photographing at Dead Man’s Cove. I had seen an image created by David Brookover, https://www.brookovergallery.com/ a few months back and was just motivated to get to the area. I connected with a local maintenance worker who was so helpful. His one statement to me about the access to the cove was that the trail while short was very steep. NO KIDDING!! Straight down in places and combined with the mud from the rain it was not easy going and coming back up was worse. Mud, Mud, Mud – to the entertainment of people in the parking lot when I returned. Whining aside Dead Man’s Cove is a magical place and I did come away with one good image. The drive home necessitated a change of clothes in a gas station in Astoria. I did stop in Portland to off load some money at ProPhoto Supply and then it was time to head home down the freeway. As usual you can get a larger view of these images by clicking on them and comments are always welcome. Prints, if desired are also available. Dead Man’s Cove certainly looks to have been worth “stealing” some Washington soil! !